Interesting in speaking to our group? 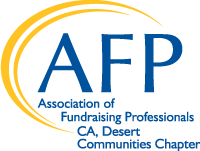 If so, please send an email to us at afpcadesert@gmail.com. - what will attendees learn from your presentation? - past speaking experience - other chapters, other groups, other non-profits? We have opportunities for speakers at lunches, breakfasts and workshops.